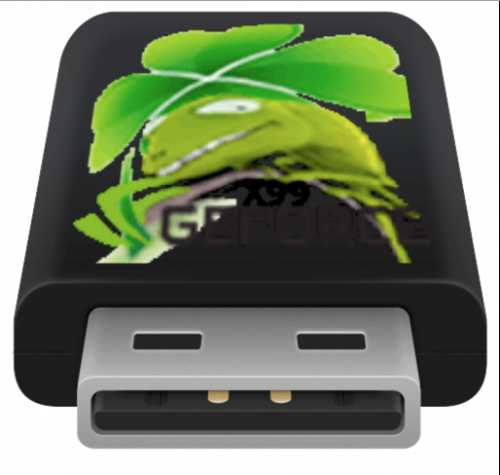 ESP Mounter Pro is a new top bar application to manage your EFI System Partition(s). You can mount or umount any ESP you have on any disk you have directly from its popover window. 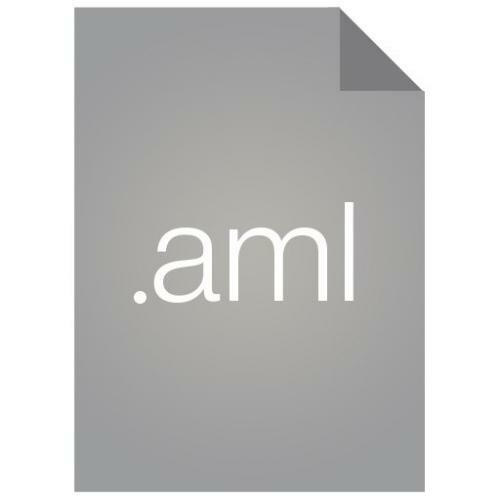 This app use advanced APIs to perform all operations and no AppleScript or scripts are used: only code! Require 10.9 +, working like a charm on Mojave Beta 2!! // Created by Micky1979 on 15/06/16. // Copyright © 2016 Micky1979 All rights reserved. Does not show an EFI Partition if your disk is not GPT (or if smaller than 1GB). Cannot mount it if corrupted!. 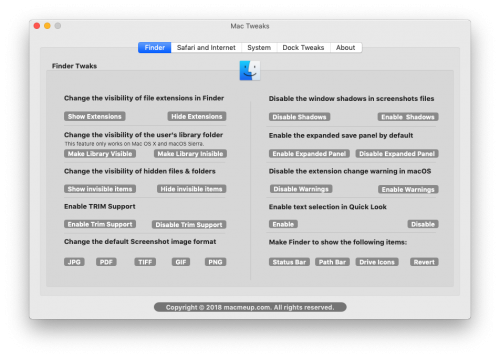 Easily take charge of macOS's internals. 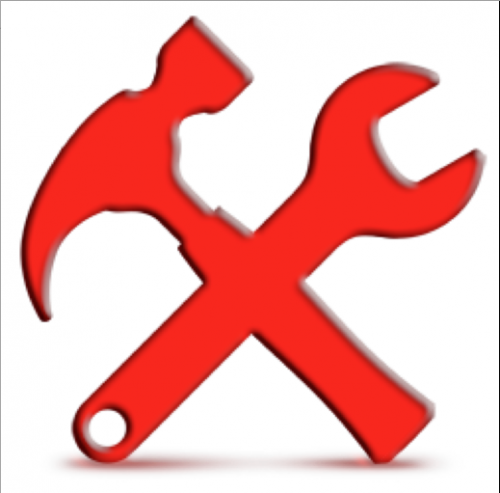 Small tool to download, compile and build the latest Clover X64 package. The script inside is editable. 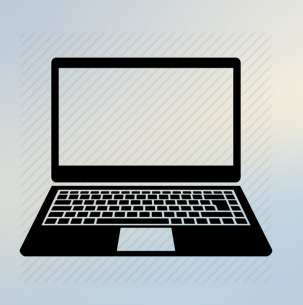 Copy to Mandatory drivers64UEFI: ApfsDriverLoader.efi, AptioMemoryFix.efi, AptioInputFix.efi. 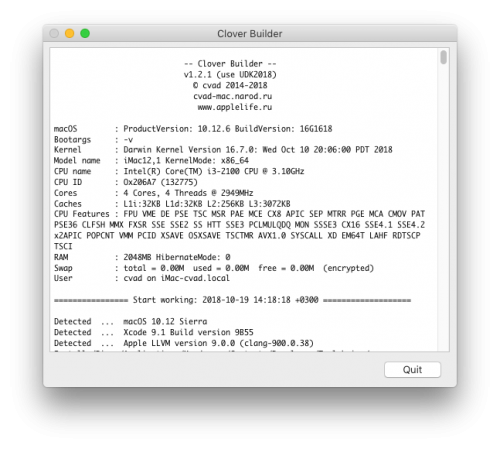 Copy to \EFI\CLOVER\tools\: CleanNvram.efi. VerifyMsrE2.efi. Make Clover_v2.4k_rNNNN.pkg without﻿ FakeSMC.kext. Make CloverISO-NNNN.tar.lzma with﻿ FakeSMC.kext. Corrected makeiso error. 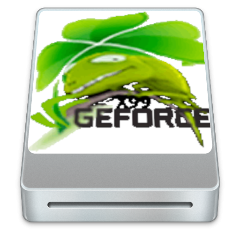 -Clover folder for some chipset with essentials config, patches, kexts and more! 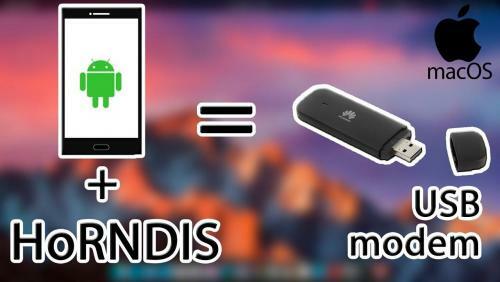 HoRNDIS is a driver for Mac OS X that allows you to use your Android phone's native USB tethering mode to get Internet access. 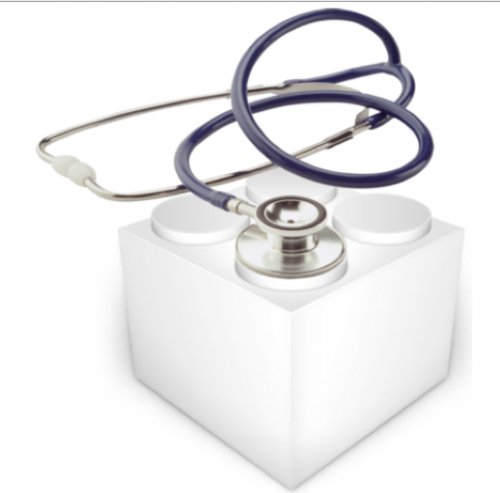 It is known to work with Mac OS X versions 10.6.8 (Snow Leopard) through 10.14 (Mojave), and has been tested on a wide variety of phones. Although you should be careful with all drivers that you install on your computer, HoRNDIS has been tested at least well enough for the author (and many others) to run full time on their own personal computers. Clover 3320. Replace ACPIBacklight by IntelBacklight. Use Shell_Full.efi. Update BrcmPatchRAM, ACPIBatteryManager, VoodooPS2Controller, FakePCIID. 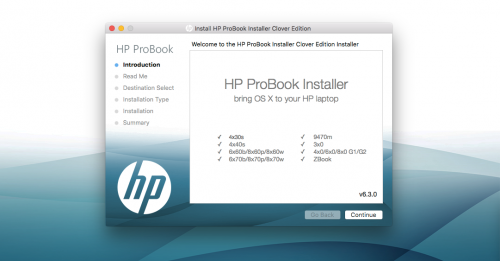 Update XtraFinder, Clover Configurator. Thanks for the help Chris 1111 ! Az MPKG t Instalálva az alkalmazásokba kapod az installert ami 10.9.x től 10.12.x ig készít retail installert. EasyKext Pro "A Minimal and Super Fast Kext installer"
The full macOS Sierra beta installer is available through Apple’s dedicated portal for developers. 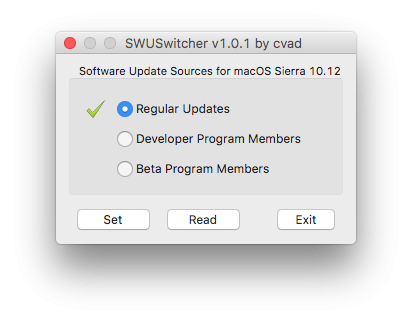 But you can install the Sierra Developer Beta Access Utility to download the latest macOS Sierra beta through the Mac App Store’s Updates tab. 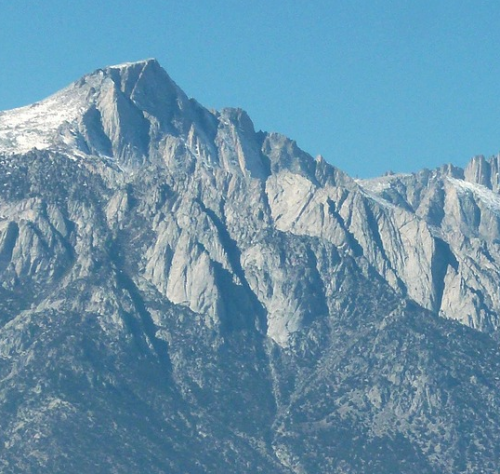 Get a Beta or Developer seed updates for macOS Sierra without first having to sign up for Apple programs. Asus P5B to get audio, Ide and others to work fine. It's a port to OS X El Capitan 10.11 of our beloved utility MenuMeters by Alex Harper, at http://ragingmenace.com. As he has not yet released the port to OS X 10.11 El Capitan, I made a minimal modification to the source code he has kindly made public so that it runs fine. Setting up Please download the preference pane from this download link. Double click the resulting preference pane. If you already have an older version of MenuMeters, the System Preference will ask you if you want to replace it. Please answer yes. The System Preference might complain that it cannot be loaded. In that case please quit the System Preference once, and relaunch it. It should work. You might also need to uncheck and then check the various meters to re-activate them, once the new version of the MenuMeters preference pane is open. 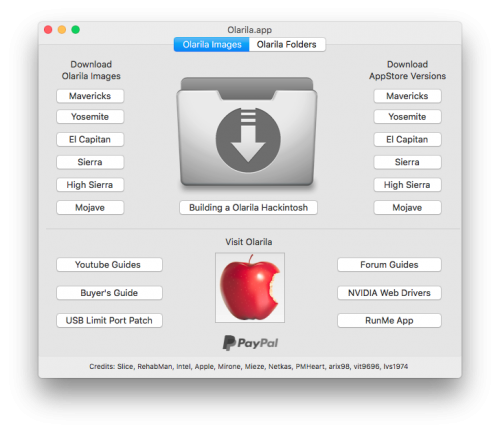 PikerAlpha's AppleIntelInfo, precompiled for use with OS X El Capitan. sudo kextload AppleIntelInfo.kext Where "AppleIntelInfo.kext" is the correct path for the kext. sudo kextunload AppleIntelInfo.kext Again, where "AppleIntelInfo.kext" is the correct path for the kext. Be sure to unload the kext when you're done, otherwise it will spam the console with messages! 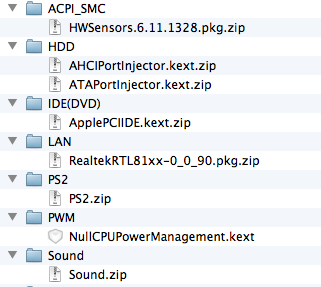 Intel ACPI tools. The NEW version 20160108 compiled by me from original sources. Use iasl compiler with your MaciASL, DSDTSE or another editor (or Terminal). To update your DSDTSE, simply right click on DSDTSE --> Show contents, drag'n'drop iasl into --> Contents --> Resources. Another editors have mostly the same way. Then type in Terminal iasl [space] [keys separated with spaces] [space] and then drag'n'drop needed files to the Terminal's window. 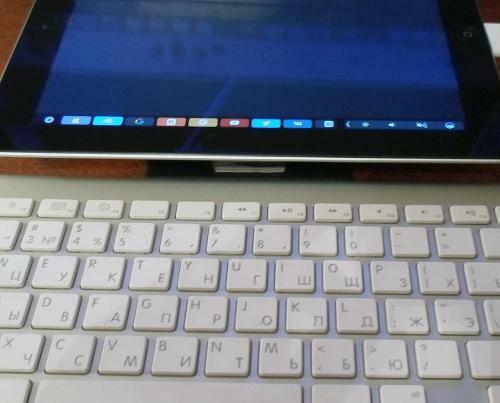 Intel ACPI тулзы. Новая версия 20160108 скомпилирована мною из оригинальных сырцов. Для использования с ДСДТ редактором MaciASL, DSDTSE или другим (или Терминалом). Инсталим сюда: Открываем правой кнопкой по "любимому" редактору --> показать ?одержимое пакета --> Contents --> Resources --> перетаскиваем драг-н-дропом на эту папку файл iasl, на замену соглашаемся. Имеем свежий компайлер. Затем в терминале набираем iasl [пробел] [ключи через пробел] [пробел] и перетаскиваем на окно Терминала требуемые файлы. After pressing the Return key you should see something like this. It means that all of SSDTs were connected to parsing (but this example shows that not all Externals were resolved).После нажатия клавиши Return вы увидите что-то наподобие этого. Это означает, что все ССДТ таблицы были прикреплены к парсингу (но в этом примере не были распознаны все External методы). External (_SB_.TPM_.CMOR, MethodObj) // Warning: Unresolved method, guessing 0 arguments External (_PR_.ACRT, FieldUnitObj) External (_PR_.CPU0._PPC, IntObj) External (_PR_.CPU0._PSS, PkgObj) External (_SB_.IAOE.ECTM, FieldUnitObj) External (_SB_.IAOE.IBT1, IntObj) External (_SB_.IAOE.ITMR, FieldUnitObj) External (_SB_.IAOE.PTSL, IntObj) External (_SB_.IAOE.RCTM, FieldUnitObj) External (_SB_.IAOE.WKRS, FieldUnitObj) External (_SB_.PCCD, UnknownObj) External (_SB_.PCCD.PENB, UnknownObj) External (_SB_.PCI0.B0D3.ABAR, FieldUnitObj) External (_SB_.PCI0.B0D3.BARA, IntObj) External (_SB_.PCI0.GFX0.AINT, MethodObj) // 2 Arguments External (_SB_.PCI0.GFX0.CLID, FieldUnitObj) External (_SB_.PCI0.GFX0.DD1F, UnknownObj) External (_SB_.PCI0.GFX0.DRDY, FieldUnitObj) External (_SB_.PCI0.GFX0.GSCI, MethodObj) // 0 Arguments External (_SB_.PCI0.GFX0.GSSE, FieldUnitObj) External (_SB_.PCI0.GFX0.STAT, FieldUnitObj) External (_SB_.PCI0.GFX0.TCHE, FieldUnitObj) External (_SB_.PCI0.PEG0, UnknownObj) External (_SB_.PCI0.PEG0.HPME, MethodObj) // 0 Arguments External (_SB_.PCI0.PEG0.PEGP, UnknownObj) External (_SB_.PCI0.PEG1, UnknownObj) External (_SB_.PCI0.PEG1.HPME, MethodObj) // 0 Arguments External (_SB_.PCI0.PEG2, UnknownObj) External (_SB_.PCI0.PEG2.HPME, MethodObj) // 0 Arguments External (D1F0, UnknownObj) External (D1F1, UnknownObj) External (D1F2, UnknownObj) External (DIDX, FieldUnitObj) External (GSMI, FieldUnitObj) External (PDC0, IntObj) External (PDC1, IntObj) External (PDC2, IntObj) External (PDC3, IntObj) External (PDC4, IntObj) External (PDC5, IntObj) External (PDC6, IntObj) External (PDC7, IntObj) External (SGMD, FieldUnitObj) And here you are a correctly disassembled Method ADBG, which refering to External Method MDBG with 1 Arg countВот пример корректно дизассемблированного метода ADBG, который ссылается на External метод MDBG c 1 Аргументом. And more: if you need to decompile your custom DSDT with your patches and if it still has many External Methods, you need to use all of the SSDTs this time too. If you deleted all of the Externals and those dependencies in the code, then no need to decompile with SSDTs and refs. В дополнение: если вы решили декомпилировать свою кастомную DSDT с примененными патчами и в таблице все еще имеются в большом количестве External методы, в этом случае также требуется использовать терминал и включить в декомпиляцию все SSDT таблицы. Если вы удалили все External методы со всеми зависимостями в коде, тогда не требуется использовать при декомпиляции SSDT таблицы и реф.файлы.